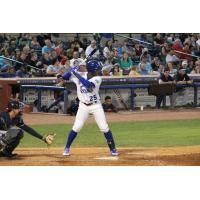 WHITAKER BANK BALLPARK (Lexington, KY) - The Lexington Legends powered over the Rome Braves in a 4-2 victory for game two. The Legends improve to 19-15 in the second half of the season (56-45 overall) and are 0.5 games out of first place behind the Greenville Drive. The Braves scored in the first inning for the second straight game. Brendan Venter hit his first career home run to left centerfield to put Rome up 1-0. In the bottom of the first inning, Kyle Isbel lined a single to left field then moved to second on a sacrifice bunt by Cristian Perez. Nick Pratto then doubled Isbel home and the game was tied, 1-1. Rome took the lead back in the top of the third inning. Drew Waters drew a leadoff walk then swiped second base. Greyson Jenista then hit an RBI single to left field and the Braves led 2-1. The Legends had an answer in the bottom of the third. Isbel led off with another single to left field then moved to third on Pratto's second double of the night. Matias then brought home Isbel with a single and the game was tied again, 2-2. Lexington took the lead for good in the bottom of the fourth inning. Manny Olloque reached on a leadoff single to left field then advanced to second when the pitcher, John Curtis, overthrew a check throw to first. Marten Gasparini then scored Olloque on another RBI single and the Legends led 3-2. Matias blasted his 30th home run of the season, a new single season franchise record for the Legends, in the bottom of the eighth inning, extending Lexington's lead 4-2. He finished the night 3-4 with one run and two RBI. Yefri Del Rosario was awarded the win, tossing 5.0 innings allowing two runs on five hits while walking three and striking out four. John Curtis was given the loss pitching 6.0 innings allowing three runs (two earned) on eight hits while striking out five. The rubber match will begin tomorrow, July 29 at 2:05 p.m. the Legends will send RHP Charlie Neuweiler (1-0, 5.45 ERA) to face RHP Odalvi Javier (3-7, 3.88 ERA). Join us for Barn at the Park and bring your friendly, barnyard animal that is not afraid of large crowds! The various animals must be leashed and not afraid of loud noises. Take care of your dirty dogs beginning at 8 a.m. at Whitaker Bank Ballpark while taking part of a Guinness World Record! Courtesy of HydroDog and Nash Academy, fans can help set the record for most dogs washed in a day when they wash their K9 for a $10 donation to Lexington Humane Society. Fans will also receive a free ticket to that afternoon's ballgame! The gates will then open for fans at 12:30 p.m. for Playtime On the Outfield with Legends players until 1p.m. Fans are encouraged to bring your glove and ball! All kids 12 and under will receive a free ticket to the game, courtesy of JiF. The schoolyear is fast approaching so come celebrate the Countdown to Kindergarten! Incoming kindergarteners will get in for free by wearing their school t-shirt and adults with them will receive a $5 box seat. Celebrate the waning days of summer with the Kids Club during the postgame ice cream social with Legends players! Kiddos can satisfy their sweet tooth after the game in the Stables down the first base side of Whitaker Bank Ballpark.